The perfect addition to your campsite, garden or patio. This curved wooden birdhouse will keep your flying friends comfortable year-round. The "Curved House" birdhouse is one of our all time best sellers, any surprise! Includes hook to hang and easy clean out on the back. 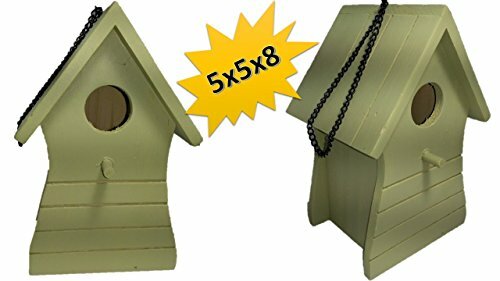 DELIGHTFUL Birdhouse Made From Wood with EASY hanging chain attached to the roofs peak. EASY - Features a Door on Back for Easy Cleaning Purpose and weather resistant Cadet Blue paint.